-- Vietnamese Prime Minister Nguyen Xuan Phuc joined talks with Prime Minister of Romania Viorica Dancila in Bucharest on Monday during his official visit to the European country from April 14 to 16. 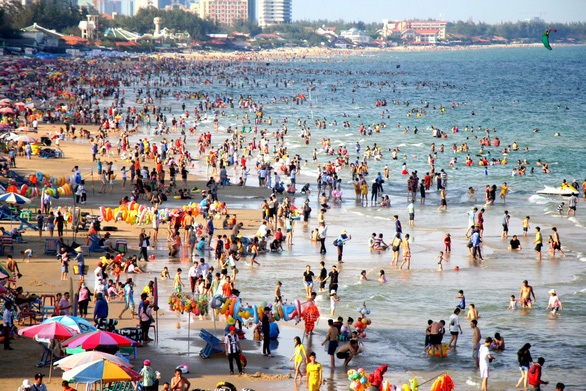 -- The sizzling weather in southern Vietnam is forecast to temporarily stop on Tuesday as rains and thunderstorms will occur in the region in the next few days, said Le Dinh Quyet, an official from the southern hydro-meteorological station. -- An explosion occurred at a substation in Thu Duc District, Ho Chi Minh City at around 3:30 pm on Monday, resulting in a blackout at multiple neighborhoods in Binh Thanh District, Phu Nhuan District, Go Vap District, and District 12. -- A total of 66 people died and 60 others were injured in traffic accidents throughout Vietnam during the three festive days marking the Hung Kings’ Festival (April 13 to 15), according to the traffic police division under the Ministry of Public Security. -- Police in the northern province of Bac Ninh are investigating a case where a local 12th-grade school girl committed suicide by jumping off a bridge on Monday after allegedly being raped. -- Officers in the north-central provinces of Ha Tinh and Nghe An on Monday arrested three men for the illegal trade and transportation of drugs and confiscated dozens of alleged drug packages hidden inside a loudspeaker. -- A 41-year-old men in Hanoi has been apprehended for allegedly luring an 11-year-old girl into a secluded alley before molesting her on April 4, after CCTV footage of the incident recently surfaced on social media. -- Three school boys aged 13 to 16 were killed after they rode a motorcycle and crashed it in the north-central province of Thanh Hoa on Monday morning. -- The People’s Committee in the Mekong Delta province of Bac Lieu on Monday kick-started the construction of a VND2.5 trillion (US$107.5 million) wind power plant which covers an area of 946 hectares. -- The car making complex of Vinfast, the automaking arm of Vietnamese conglomerate Vingroup, is expected to be put into operation in June, about three months ahead of the original schedule, the company confirmed on Monday.